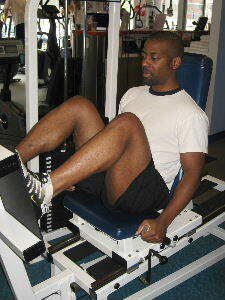 The Leg Press is a great multi-joint leg exercise for the quadriceps, glutes, and hamstrings. This page has pictures and a few tips on how to do this exercise. When possible leg workouts should emphasize multi-joint exercises because mutli-joint exercises are more efficient and more functional. You can spend a lot of time in the gym isolating every leg muscle. You could do one exercise for the glutes, one exercise for the inner thigh, one exercise for the outer hip (glute medius), one exercise for the quads, one exercise for the hamstrings, and one exercise for the calf. Or you can do one multi-joint leg exercise and work all those muscles at the same time. In addition to efficiency, multi-joint leg exercises are more functional. The term functional training simply means that the exercise helps to improve every day or sports functions. Multi-joint leg exercises are better at improving walking, running, and jumping than isolation exercises that only work one muscle at a time. There are a few different versions of this leg machine. Some are vertical, some are horizontal, and some are reclined. In every case the form is very similar. The main thing that changes is the angle of the hip and knee. Each machine will have a slightly different emphasis on all the leg muscles. Starting Position: Begin by sitting or lying in a comfortable position. Position your feet parallel to each other and start in a position with the knees around 90 degrees. Form: Exhale and press against the machine and straighten your legs. Hold for a brief second at the top and then slowly lower to the starting position. Personal Trainer Tips: Move in a slow and controlled manner, and be careful not to lock out your knees at the top of the motion. When you perform this exercise, be mindful of the alignment of your legs. When your legs and hips are weak the tendency is to let the knees cave in during this exercise. Do your best to keep your ankles, knees, and hips in the same line. 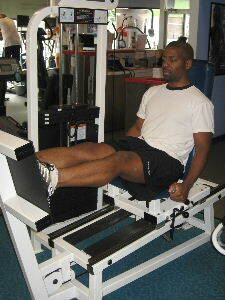 The leg press is a great exercise, but squats and lunges are also great multi-joint exercises. And there is an added benefit of core strength and balance improvement when performing squats or lunges. If you want to develop your leg muscles, build muscle mass, or simply tone your legs, try to spend more time doing multi-joint leg exercises in your workouts.